There is nothing wrong at starting with outsourcing sites such as Upwork, Freelancer etc. This is basically how many of us got started and got accustomed with the layout of the freelancing land. The issue arises when you as a freelancer start to work and made mistakes which make you cringe in the future. Your first few forays into the world of freelancing do not make you realize that some of your actions can get your work and time wasted by some of the devious clients. It is easy for you to lose time and money if you are not prepared for working in this field. 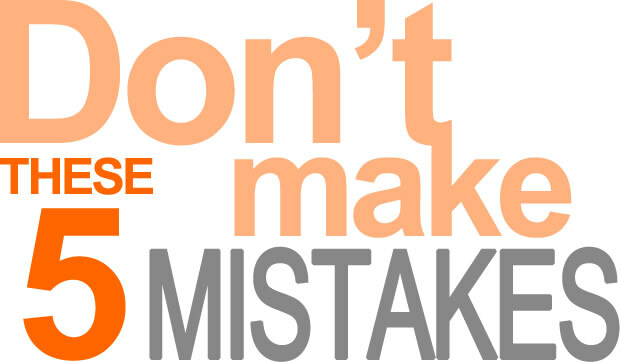 Making mistakes is a natural part of learning process and as long as you learn from your mistakes, you don’t feel bad about them in your life. To help you start out, there are five mistakes that you can make while starting as a freelancer and how you can avoid having a super successful career. Freelancing trends are helping the independent workers to do more work and tackle it more flexibly than ever before. Being a freelancer lowers the barriers for working and increasing the levels of income in a much better way. The most obvious thing that attracts more and more people towards this field is “flexibility”. But the problem by being flexible means that the clients know and they can test you by giving you more work with tight deadlines. Flexible working tend to appeal clients as they can simply take advantage by asking you to set a precedent that you might not be comfortable in the long run. So it is better to avoid taking such decisions. Setting and negotiating rates seem one of the most intimidating parts of freelancing therefore the first thing you must do is ascertain the hourly rate you are willing to work. If you are a full-time freelancer, then always keep in mind your personal overheads that are the cost of keeping a roof over your head, food on your plate and so on. As a freelancer it depends on how highly you value your own work and time, do not limit your earning potential by charging low for your services. View your work from a client’s eye and a commercial prospective and price accordingly. The relationship with client is tricky to deal with especially when you are working as a freelancer. There are many types of clients that may curse your creativity, so when you find fault with such clients you need to interact effectively with them. When something does not seem fit, always ask for a clarification. Being professional requires you to clear all the project deadlines and fee matters before starting with a client. As a newbie freelancer, you probably send dozens of query letters, each written in a unique way to attract more clients. But if you get a repeat work from the same client, then it can be a good dose for you. Getting repeated work from a previous client means a long-term relationship because you are familiar with that work and know how to deal with it. And also this will not shift your focus on the new projects and you can work freely with the possible long-term clients. There are a lot of clients that do not appreciate anything from the freelancers and do not give respect due to rational hatreds. You need to keep warning signs that arouse during the initial consultation and keep good manner for the sake of professionalism in future. Previous article Use These Freelancing Tips at your own risk!